Microelectronics from Austria? Really? Patrick Schrey is meanwhile wearily used to this reaction. For him, as an electrical engineer, it’s normal to be ever present but never seen. Austria has its own Silicon Valley. Who would’ve thought it? I wasn’t aware before that microelectronics is developed and produced in Austria. For me microelectronics was always far away in Silicon Valley or in the Asian region. But, in fact, I can reach a manufacturing facility within the hour from my flat in Graz – comfortably even by public transport. Graz really does represent a kind of Silicon Valley of Austria. And right in the middle is TU Graz’s Institute of Electronics, where the next generation of microelectronics engineers are being trained. Every year in the autumn, my home institute invites electronic-chip producers to Inffeldgasse in Graz for the event "The Silicon Valley of Austria" to give students the opportunity to make personal contacts and get to know the various fields for potential work. Everyone who is interested in microelectronics is cordially invited. What makes this event possible is the very high concentration of microelectronics firms around Graz, and it appears that TU Graz is not all altogether uninvolved in this. As far as I know, many firms have chosen this location precisely because of its proximity to TU Graz. And this is hardly surprisingly because the special Analog Chip Design area of concentration in the Electrical Engineering master’s programme is not found at every university. The properties and peculiarities of microchips are specifically taught there. Many of the offered courses are also in the Information and Computer Engineering study programme in the Microelectronics and IC Design list of elective subjects. Integrated components – in other words, those built into a chip – don’t always behave in the same way as they do when they are produced singly. Designing such circuits requires special care, since they can sometimes lead to unforeseen problems which don’t occur in circuits with single components. Dealing with development and simulation environments is a part of the study programme. 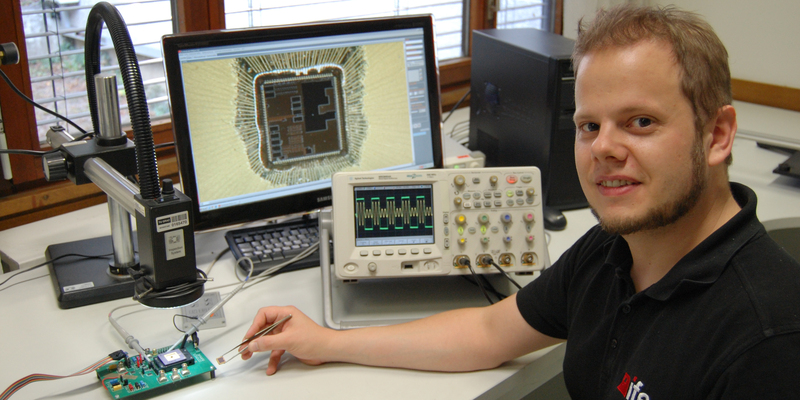 The development and simulation environments at TU Graz are in line with those of the surrounding industry and are thus at the cutting edge. This enhances job applications as training times in a new job can consequently be shortened. But why ‘analog’ when the whole world is talking about ‘digitalisation’? The whole world? Is a small institute putting up resistance? No, that’s obviously not the reason. At the end of the day, digitalisation pioneers have to come to terms with the fact that we humans and our environment are analog. This means the information from our environment has to be captured, processed and converted before it can be processed by a digital processor. That might sound rather lofty. But when you check each morning whether to wear a T-shirt or a pullover, you’ll see what I’m driving at. Capturing, processing and converting signals. Let’s take a thermometer as an example. 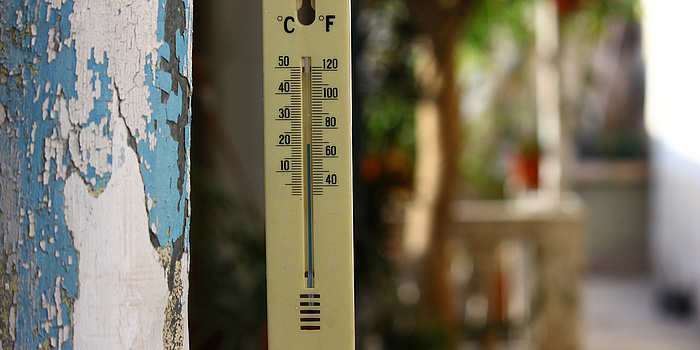 A good old-fashioned thermometer is the perfect example. Here, the temperature is converted into a change of the column height by means of thermal expansion. The column height allows us to measure the temperature with ease. In other words, the thermometer has captured, processed and converted the hidden value of temperature so that we can make the right choice between wearing a T-shirt and a pullover. The Analog Chip Design area of concentration deals exactly with building bridges or interfaces between the analog environment and digital world. How can we develop electronics which can record sensor signals appropriately? How can data be processed without using up a lot of power? How can data be efficiently converted without losing a lot of time? Furthermore, you also have to consider where electronics is deployed. Requirements vary wildly depending on the field of application. The chip in a smart phone should use up as little power as possible so that the battery doesn’t have to be recharged so often. But for a chip in a car, the amount of power required is possibly a minor problem. Instead, the chip always has to work reliably – from the coldest winter day to the hottest summer day. Safety here is right at the top of the list of priorities. Or perhaps you are lucky enough to develop a chip for a space mission. Only a handful of selected chips will be produced for this, but they have to master an almost inconceivable range of challenges. It is this diversity of areas of application that make microelectronics so exciting. Personally, I won’t have to worry about a job for many years as all future technologies build on electronics. Smart home, autonomous driving, Internet of Things? All of these rely on the electronics. Even now, our daily life is permeated with electronics. My day begins just as it does for many other people: My alarm goes off reliably every day thanks to electronics. And that’s just the beginning. Checking your calendar, reading emails, following the news, buying tickets, paying for your midday meal by card, and so on, and so on, and so on. Of course, many research institutes are involved in many of these things. But electronics is the basis on which so much has been built. Electronics is so self evident for us that it appears invisible, but nevertheless it accompanies us constantly through the day. Electronics is simply all-pervading, and the new trends will increase the density of electronic components in our environment even more. And so microelectronics will remain for a little while longer the unsung hero of everyday life – unseen but ever present.